The UC5550 System on Module has the processor and memory needed to run the most intense embedded applications, thanks to its 216 MHz Cortex-M7 and 32 MByte of RAM. Its built in native parallel TFT display makes it an ideal option for applications that require professional display support. Pricing, purchasing and other information can be found on the UC5550 Page on our main website. Modules designed for the UCM standard have more functionality available when not following the rules set by the standard. It is up to you to decide how much your design will follow the UCM standard. This table lists the available peripherals. The "overall" column shows the available pins if the design did not follow the UCM standard. The TinyCLR tutorials is a good resource on using these peripherals. The UCM development options can greatly simplify the process of building a product or prototype using the UC5550. 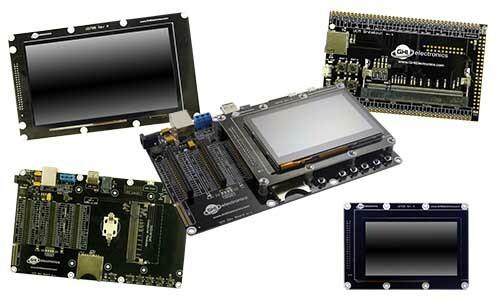 Options include a development board and displays which can get you programming in minutes. We are assuming you are using the UCM Development Board for all instructions provided. TinyCLR OS provides a way to program the UC5550 in C# or Visual Basic from the Microsoft Visual Studio integrated development environment. To get started you must first install the bootloader and firmware on the UC5550 (instructions below) and then go to the TinyCLR Getting Started page for instructions. Download the UC5550 bootloader here. Connect your device to the USB client port. Put the board in DFU mode: Hold the SYS A pin low and press/release the reset button. Wait for a second then release SYS A. Windows Device Manager will now show "STM Device in DFU Mode" under the 'Universal Serial Bus controller' TAB. Go to the STM32 Bootloader to learn how to upload DFU files. Activate the bootloader, hold the LDR0 signal (SYS B) low while resetting the board. Now that you have installed the bootloader and firmware on the UC5550, you can setup your host computer and start programming. Go to the TinyCLR Getting Started page for instructions. You have the choice of loading the module with your preferred RTOS. Also, you can load Native Code in TinyCLR OS at runtime that works alongside your managed application. Native code can be used to provide improved performance or access to advanced features. The memory area reserved for native code in TinyCLR OS on UC5550 starts at 0xC1F00000 and its length is 0xFFFF8. The WiFi module is made by STMicroelectronics. this page has further details. The schematic for the UC5550 can be found here. We also offer customized, non-stock versions of our SoMs. Many options are available, such as various sizes of external QSPI flash. Please contact us for details. We will always do our best to provide you with a module to fit your exact needs. The following CAN bit timing parameters were calculated for a UC5550 driving the SN65HVD230 CAN transceiver chip. See the CAN Tutorial for more information. Want to quickly build your prototype? Check out the UCM Development Options.